Historical romance with a time-travel twist! 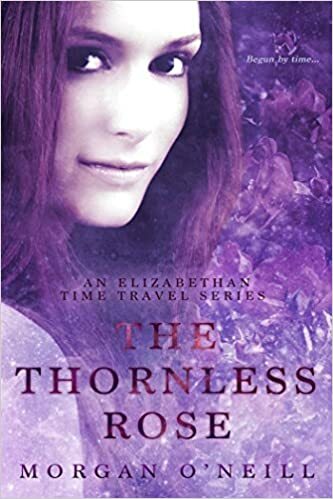 Morgan O’Neill (the collaborative pen name of Cary Morgan Frates and Deborah O’Neill Cordes) has created an entertaining and engaging blend of historical fact and fictional fancy in The Thornless Rose, allowing two characters who would not otherwise have met to not only meet but fall in love – centuries before either was born. The story begins on Christmas Eve 1945, when Dr. Jonathan Brandon, dashing RAF officer, decorated war hero, brilliant surgeon, vanishes from a pub in post-war London and finds himself in the same pub in Elizabethan times. We then move to London in 2014, when Anne Howard, American high school history teacher, is spending the summer with her grandmother, Catherine. Anne learns Catherine’s secret: she had another fiance before Anne’s grandfather: a dashing RAF officer named Jonathan Brandon, who disappeared a week before their wedding. Because of a letter left in an old family Bible, she knows where, or rather when, Brandon is/was. It seems that susceptible people plus thin places equals time travel, and soon Anne experiences it for herself. Thus, a 21st century woman and a mid-20th century man meet, fall in love, and not so quietly insert themselves into history. The authors clearly did a great deal of research into settings, food, clothing styles, social expectations, medical practices, etc. Because of this, I was surprised when a character who is supposed to be a history teacher used the terms “Old English” and “Elizabethan English” interchangeably. It was believable that Anne would stumble in her actual use of the language, addressing her social superiors with the informal “thou” and mixing up verb conjugations, but I wasn’t entirely convinced of the fluency of any of the characters. Still, that is a minor nitpick in an overall fun read with a convincing historical background. The book is alive with a real place in a real time, populated with actual historical people and believable fictional characters. Heroes, villains, and salt-of-the-earth folks abound, variously threatening or caring for Anne and Jonathan. Queen Elizabeth I herself has an active role in the story. Although the time travelers try not to change history, Jonathan can’t help using his medical knowledge to save lives, while Anne continually slips into contemporary idioms. A few characters know their secret, and not all have their best interests at heart. Humor, danger, and steamy love scenes abound. All ends on a positive note, but with enough unresolved to point to a sequel.